The essence of the design process is to envision novel solutions in order to meet certain real or perceived needs and express a certain intention through novel interactions and relationships.While science tends to focus on how the world is and how it came to be — an essentially backward looking activity that may venture to predict the outcome of experiments based on abstract linear extrapolations from past observations — design tends to focus on how the world could be in the future and proposes feasible pathways to create such a future. In 2005, the UK Design Council published a report on Sustainability & Design. The report admitted the urgent need to re-contextualise design theory and practice in a more holistic and encompassing way that acknowledges the complexity of challenges associated with creating a sustainable society. It identified a wide range of specific skills that are important for designers in the 21st century. This thesis has addressed almost all the skills mentioned in the report, for example: the need for trans-disciplinarity, multiple perspectives, eco-literacy, dialogue and communication, sensitivity to different scales and the need to reconsider environmental ethics. 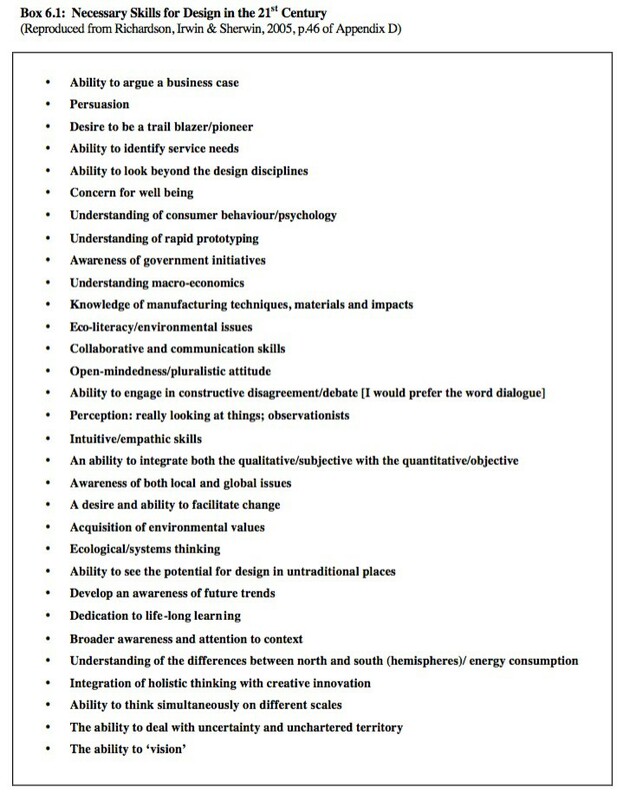 After interviewing a wide range of people engaged in mainstream product design as well as a number of sustainable product designers, the authors of the Design Council report offered the following summary of essential design skills (see Box 6.1). The ability to vision is the last but certainly not the least important skill on their list. Any design strategy is useless if there is no clear vision of where that strategy is supposed to take us. The process of creating a collective and trans-disciplinary vision for a future of human, societal, ecosystem and planetary health will emerge as the central means of catalysing the transformation towards a sustainable human civilization during the 21st century. This process will define the quality of life and meaningful existence of current and future generations. The process of collective visioning based on an integration of multiple perspectives will be central to the creation of locally adapted sustainable communities that cooperate locally, regionally and globally in order to meet true human needs for everyone and within the biophysical limits of local ecosystems and the global biosphere. It is through this community based process of life-long learning and dynamic adaptation of our guiding visions that design will be able to act as trans-disciplinary and trans-epistemological integrator and facilitator (see also chapter one). This image is not in the 2006 PhD thesis this excerpt is taken from. It is from a recent Transition Design course with Terry Irwin, Cameron Tonkinwise and Gideon Kossoff (from Carnegie Mellon School of Design and the University of New South Wales). The graphic (source) illustrates well how we can work with preferable, probable, plausible and possible futures. Visioning is about preferable futures and design can make them probable. “Visioning processes provide a mechanism whereby diverse interests are brought together to develop and reach agreement on a common, preferred vision for the future of an area and/or community” (Baxter & Fraser, 1994). Visioning is therefore centrally important for a community-based approach to designing humanity’s appropriate participation in natural process. The intention to increase human and planetary health, as the prerequisite for long-term sustainability, describes the common vector that unites the diversity of locally and regionally adapted human communities and societies behind the common goal of sustaining the continued evolution of life and consciousness through turning the vision of a sustainable human civilization into reality. While the now increasingly outdated goals that motivated conventional science during the past three hundred years were chasing after the impossible utopia of total prediction and control of nature, the new sciences and the emerging natural design movement are motivated by improving and informing humanity’s appropriate and sustainable participation in natural process. This is an attainable utopia, a vision that we can turn into reality! Victor Margolin believes: “As an art of conception and planning, design occupies a strategic position between the sphere of dispositional ethics and the sphere of social change. This is its power.” He argues: “Design is the activity that generates plans, projects, and products. It produces tangible results that can serve as demonstrations of, or arguments for, how we might live” (Margolin, 2002, p.88). Design is the process of envisioning and creating our collective future. It is important to understand that in the process of creating a vision of a sustainable community, society, and civilization we should not be restricted by what may be perceived as insurmountable obstacles to achieving that vision. The initial formulation of a vision has to be idealistic, creative, poetic, aesthetic, ethical, intuitive and imaginative. Rational reasoning from a particular perspective should not restrict the integrative and participatory process of creating the initial vision. First, the best-case scenario, the ‘have our cake and eat it’ option, the win-win-win optimal future state has to be clearly described and en-visioned. This creates a collective goal desirable to everyone and therefore provides the basis for engaging the participation of diverse stakeholders in the long-term process of turning such a vision into reality through appropriate design. Baxter and Fraser see the value of creating a vision in the way it connects the future and the present. First, a vision helps us to put our current behaviour into context and perspective, and second, it “catalyses new actions and partnerships in order to move the community or organization towards the future it wants” (1994, p.4). They identify six main characteristics of visioning which make it a uniquely useful process. These are summarized in the table below(see Table 6.1). Only by honouring the entire breadth of diverse intellectual and cultural perspectives and by acknowledging the important, valid and meaningful contributions of complementary — but possibly contradictory — epistemologies can we hope to create a meaningful and inspiring vision that has the power to motivate all of humanity to engage in the transformation towards a sustainable human civilization. The scientific, materialistic perspective that, through the emerging holistic sciences, is increasingly acknowledging fundamental interconnectedness, interdependence and unpredictability, provides important insights about the dynamics of complex systems like societies, ecosystems and the biosphere. Ecology and complexity theory can help us to participate appropriately in natural process. However subtler modes of consciousness, that are aware of our participatory and co- creative involvement in both the material and immaterial dimensions of reality, are also important informants of such a vision. Any globally and locally inspiring and meaningful vision, by definition, will have to include contributions from diverse spiritual, ethical, psychological, cultural and aesthetic, as well as scientific points of view. The globally transformative vision of a sustainable human civilization has to be flexible and adaptable enough to accommodate healthy expressions of an enormous diversity of material and immaterial (internal and external) perspectives. At the same time it has to establish a realistic, socially and ecologically literate consensus about how to proceed in order to implement this collective global vision through the action of empowered and locally adapted communities everywhere. The vision of a sustainable human civilization must be meaningful enough to be desired by everyone. So much so, that it motivates all global citizens to engage in local, regional, and global cooperation in driving the long-term process of turning this vision into reality. Jonathan Ball’s doctoral research reviewed a variety of different approaches to creating community based visions and developed a conceptual framework for applying environmental visioning to land-use planning and bioregional design. Ball (1999) identified a number of common characteristics and steps of visioning as a tool for designing meaningful and desired futures intentionally. 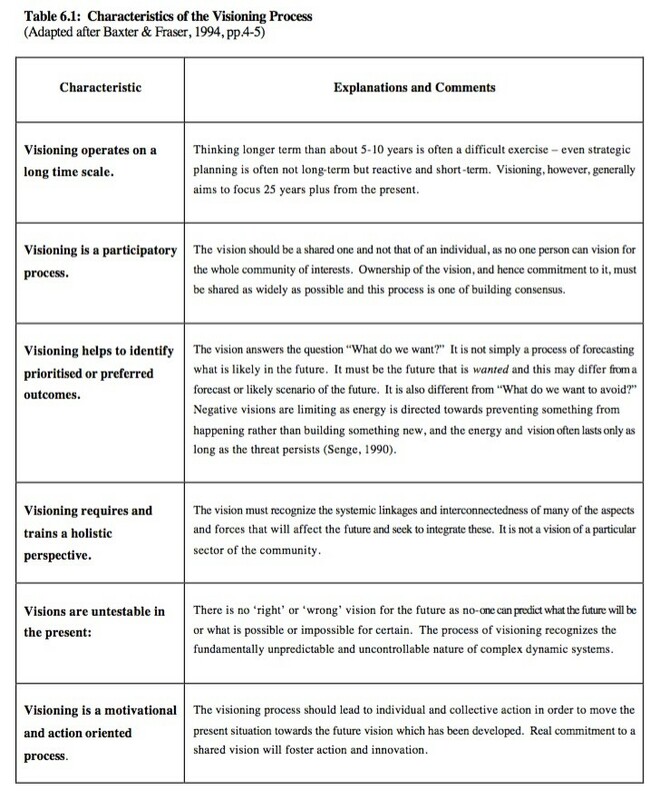 The Table below (see Table 6.2) shows a summary of three related but differently focussed approaches to the visioning process, as provided by Jonathan Ball. This multiple and complementary perspective on the appropriate steps that should be applied within a successful visioning exercise provides a more integral understanding of visioning as a potentially powerful tool for sustainable design. 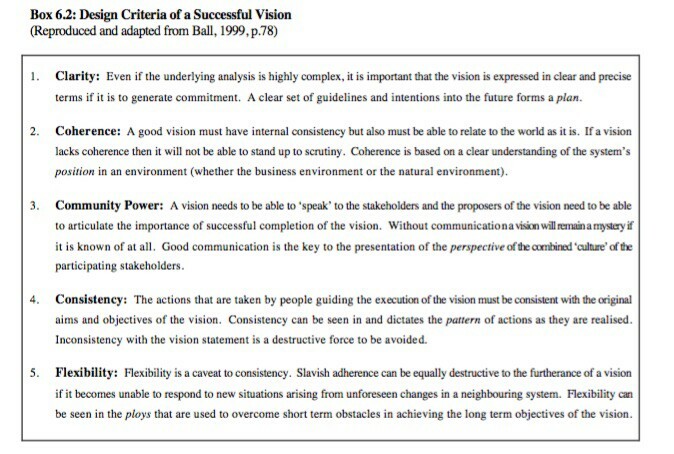 The Box below summarizes five common characteristics for the design and realization of successful visions as proposed by Jonathan Ball (see Box 6.2). The global vision of a sustainable human civilization will motivate and be composed of a wide diversity of regional and local, community-based, visions. Empowered local communities will be the active agents of change that will implement sustainability through appropriate participation in natural process. Such communities will act collectively at the appropriate scale of local adaptation to ecosystems and regional self-reliance and sustainability, and simultaneously cooperate internally and externally in the process of facilitating the realization of this vision locally and globally. Alan Sandler emphasizes the inherent potential for the visioning process to act as a driver for transformation towards sustainable practices. A community-based, inclusive and participatory approach “in which members share their personal vision and shape them into a shared vision providing energy, coherence and direction for the communities’ diverse programs and services.” Sandler defines vision as “an idea or image of a desirable future which captures the commitment, energy and imagination of key people in working towards its realization” (Sandler, 2000, p.218). 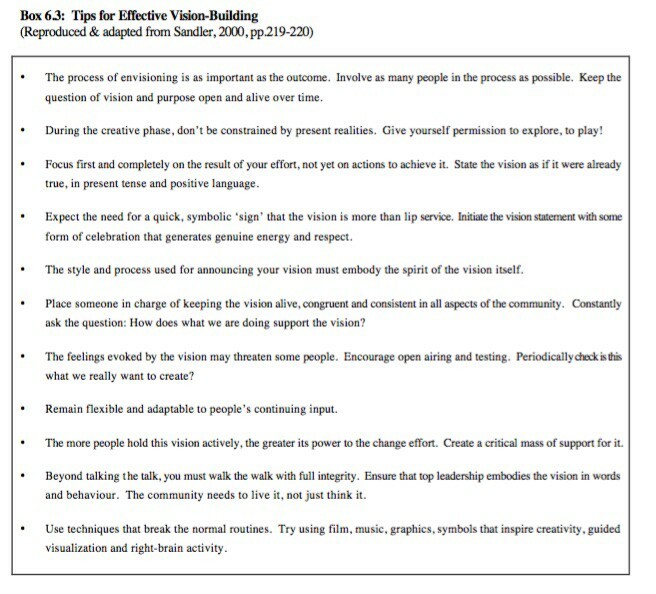 The Box below summarizes a set of “tips for vision building” compiled by Alan Sandler (see Box 6.3). Throughout this thesis, I have repeatedly emphasized the important role of an actively engaged and socially and ecologically literate citizenship in the community based process of creating locally adapted, sustainable communities. Working towards the realization of an inspiring and desirable vision motivates such active engagement. The process of visioning is, on the one hand, an effective way to engage the whole community and its diverse stakeholders in the process of defining what a desirable and sustainable future would look like. On the other hand, attempting to realize a vision provides the basis for the continuous learning process that informs the community about the appropriateness of the strategies it chooses to implement the collective vision. There have been a variety of distinct but complementary approaches to working with the visionary aspects of the design and planning process within more or less inclusive communities. Scenario planning, as described by Peter Schwartz in The Art of the Long View (Schwartz, 1991), future workshops (see Jungk & Müllert, 1987), and future search (Weisbord & Janoff, 1995) are worth exploring in this context. 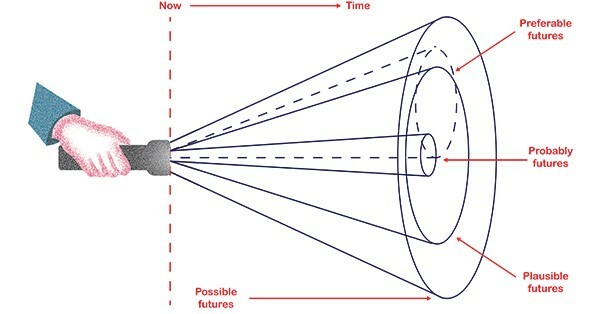 Baxter and Fraser (1994) discuss the differences between visioning and forecasting or scenario planning in more detail. The scope of this thesis does not allow me to enter deeper into these issues, which will provide points of departure for future research. The actual methodologies that can facilitate successful visioning as well as the flexible and adaptive implementation of established visions through widespread and appropriate participation are clearly of central importance in the transformation towards sustainability. Chapter one already emphasized this through the discussion of the role of trans-disciplinary design dialogue and tools like non-violent communication, mediation and consensus decision making. The Spiral Dynamics approach offers one methodology for helping people to cooperate despite differences in their dominant worldview or value system (see chapter one). In Solving tough problems, Adam Kahane, a founding partner of ‘Generon Consulting’ and the ‘Global Leadership Initiative’ offers a variety of tangible examples of how such trans- disciplinary, inclusive and participatory design processes are already being employed to find appropriate solution (see Kahane, 2004). He emphasizes the importance of personal openness to change, learning and new and transformative insights. The anatomy of change is holarchical, with changes on each level affecting changes on all other levels. In order to affect change effectively we have to begin with ourselves. Like Don Beck and Christopher Cowan, who developed Spiral Dynamics (see Beck & Cowan, 1996), Adam Kahane contributed to the peaceful transition from South Africa’s apartheid regime to a democratically elected government through facilitating conciliatory workshops that helped to shape a collective vision for the future. Kahane asks the important questions: “How can we solve our tough problems without resorting to force? How can we overcome the apartheid syndrome in our homes, workplaces, communities and countries, and globally? How can we heal our world’s gaping wounds?” (Kahane, 2004, p.129). How can we participate in salutogenesis? 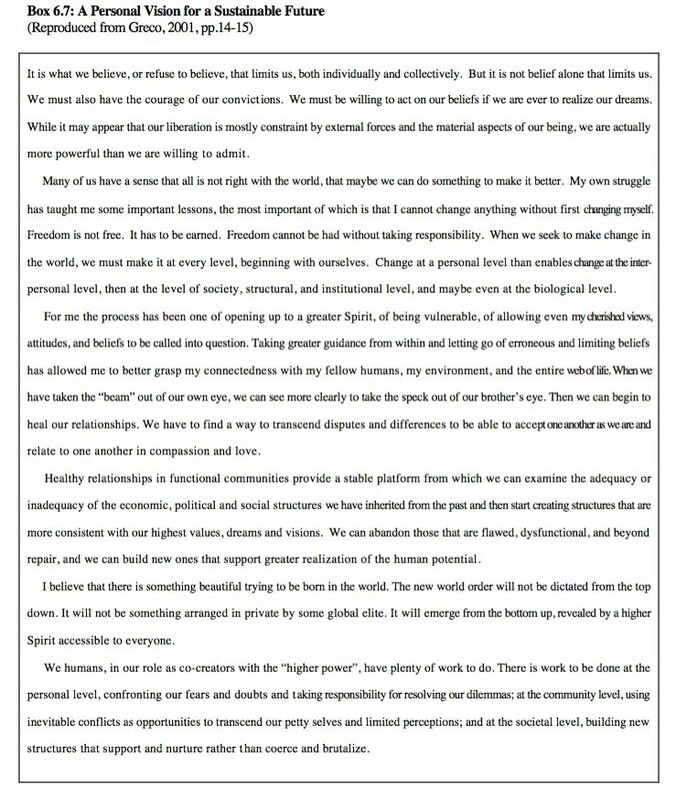 The answer lies in collectively engaging in trans-disciplinary and trans-epistemological dialogue that allows us to see issues from various points of view and therefore allows us to integrate different kinds of knowledge into a more collective, inclusive and integral wisdom that can guide appropriate participation and inform the process of turning the vision of a sustainable human civilization into reality. Kahane proposes: “We have to shift from down-loading and debating to reflective and generative dialogue. We have to chose an open way over a closed way.” He believes that when we make “this simple, practical shift in how we perform these most basic social actions — talking and listening — we unlock our most complex, stuck problem situations. We create miracles” (Kahane, 2004, p.129). Such miracles, based on trans-disciplinary and trans-epistemological dialogue, are necessary in order to create the attainable utopia of a sustainable human civilization. 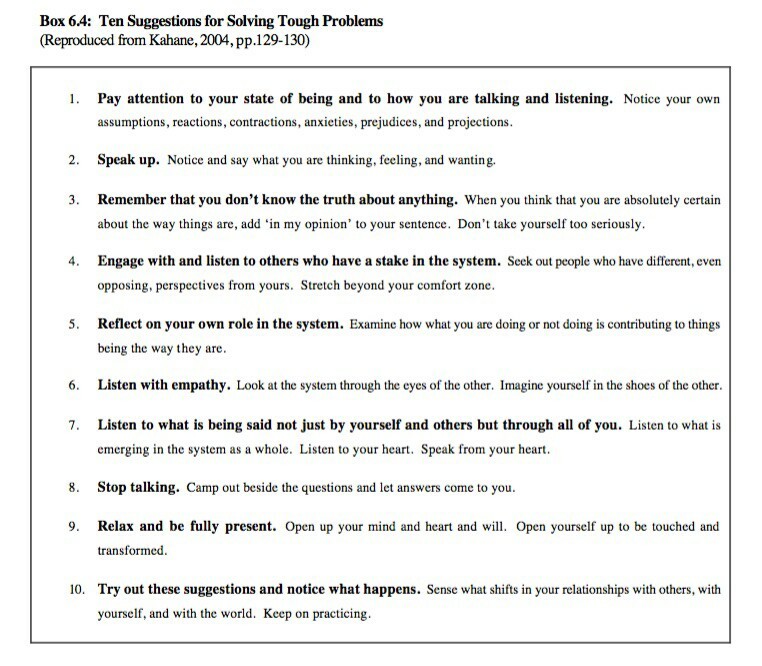 The Box below summarizes a number of suggestions made by Kahane about how we can facilitate the dialogue about tough problems (see Box 6.4). In chapter one, I proposed that the creation of a sustainable future for humanity is the ‘wicked problem of design’ in the 21st century. The list below offers advice on how each one of us can participate in the process of offering appropriate solutions to this wickedly complex problem. The ability to participate in such a way in collective decision making processes and collaborative problem solving should be nurtured and practiced in all formal and informal education. It is a crucially important skill for responsible citizens in the 21st century. Kahane (2004) describes and contrasts a ‘closed way’ of trying to solve problems from within a limited perspective and resisting any other approach, and an ‘open way’ of creating solutions to tough problems by acknowledging their full complexity and by integrating multiple perspectives. The latter creates and informs the vision of a sustainable human civilization. Many different formulations of what a sustainable human civilization may look like will have to be proposed in order to provide a broad basis for the dialogue by which we can establish a basic consensus about how to proceed at the local, regional, national and global scale. A scale-linking conceptual framework that allows us to integrate diverse issues and address issues in different ways on different scales will hopefully facilitate and structure trans- disciplinary dialogue. Just as the map of value-systems and worldviews provided by Spiral Dynamics allows us to give validity to a variety of different perspectives, salutogenesis and health describe the most fundamental intentionality and goal of sustainability. I believe we can accomplish great and profitable things within a new conceptual framework: one that values our legacy, honours diversity, and feeds ecosystems and societies … It is time for designs that are creative, abundant, prosperous, and intelligent from the start. I will use the remainder of this exploration of the role of vision in design to introduce a variety of different formulations of hopeful visions of sustainability and the strategies of appropriate participation they propose. By setting these different visions side by side, just like I have set the different approaches to sustainable and ecological design side by side, I hope to open a space in which underlying patterns become clear and a multi-facetted vision of a sustainable human civilization and the appropriate pathways towards that vision can emerge. The Australian sociologist Ted Trainer has suggested that we need to shift from a society of consumers to a society of conservers. In his opinion, a sustainable society would distinguish itself through much greater self-sufficiency at the community and regional scale; people would live more simply, but have a higher quality of life; they would cooperate to create more equitable and participatory communities, and they would need to create a new economic system. He also recognizes that for this shift to occur, a fundamental reorientation and change of value system is needed (Trainer, 1995, pp.9–15). 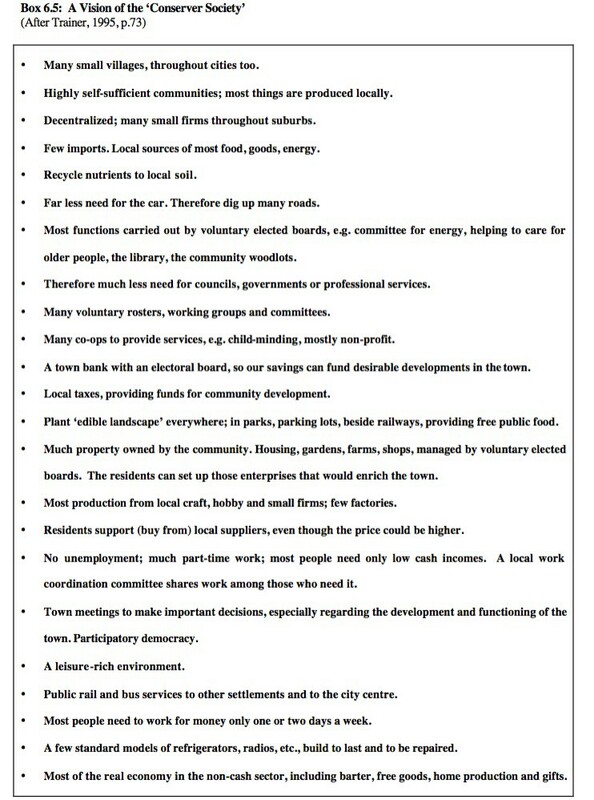 To illustrate his vision, Trainer compiled an instructive list of design characteristics that would guide the creation and re-design of settlements in such a conserver society (see Box 6.5). In the recent 30 year up-date of the seminally influential book Limits to Growth, its authors explain: “Visioning means imagining, at first generally and then with increasing specificity, what you really want … not want someone has taught you to want, and not what you have learned to be willing to settle for.” They propose: “Vision, when widely shared and firmly kept in sight, does bring into being new systems” (Meadows et al., 2005, p.272). Within the limits of space, time, materials, and energy, visionary human intentions can bring forth not only new information, new feedback loops, new behaviour, new knowledge, and new technology, but also new institutions, new physical structures, and new powers within human beings (Meadows et al., 2005, p.273). Meadows et al. conclude that “a sustainable world can never be fully realised until it is widely envisioned.” They emphasise: “The vision must be built up by many people before it is complete and compelling” (Meadows et al., 2005, p.273). The Box below summarizes how Meadows et al. 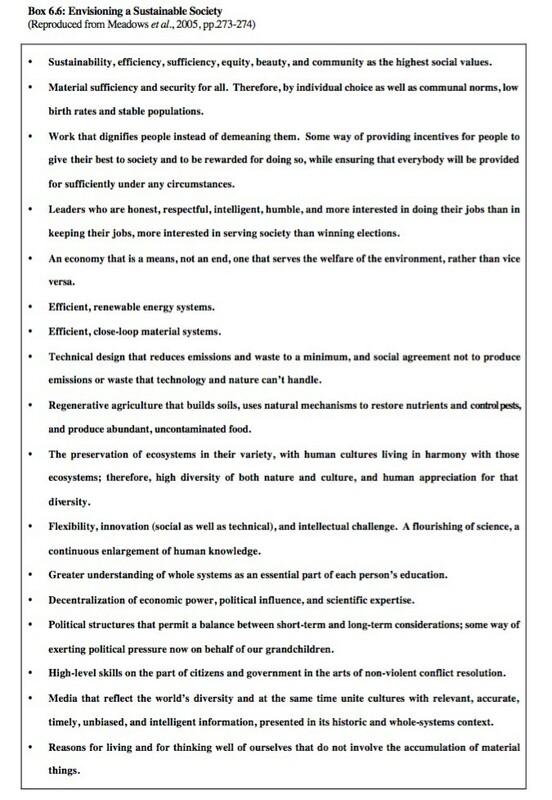 suggest we may begin the process of envisioning a sustainable society (see Box 6.6). Their proposed vision revisits many of the issues discussed in this thesis. My intention has been to provide the reader with a trans-disciplinary synthesis of a wider vision that is already emerging along with the emergence of the natural design movement. Planners, designers, politicians, economists, scientists, philosophers, social activists, educators, and business people everywhere have already begun the long process of defining the vision of a sustainable and therefore equitable future for everyone — a future of human and planetary health. In putting the different but already existing formulations of such a vision side by side, I have demonstrated that there is a significant amount of overlap between the goals and solutions proposed within the different disciplines. From within each discipline, different pieces of the bigger puzzle are added. Each one of them strengthens the overall vision and the various contributions mutually reinforce each other in the creation of a synergetic and powerful ‘leitmotiv’ for turning the vision of a sustainable human society into reality. Whether we take responsibility or not, we can’t but participate in the creation of the world around us through our attitudes, actions and designs. Our dreams and aspirations, every interaction we participate in, everything we think, say and do exerts a creative power on the world around us and as the world changes in accordance, so do we. We are continuously in danger of imprisoning ourselves in the walls of our own mental constructs, our guiding stories and ‘scientific theories.’ We collectively create the living and transforming myth of who we are in relation to each other, the community of life, the planet and the universe and this myth becomes our reality. Such is the power of meta-design! Design is the expression of intentionality through interaction and relationships. Intentionality forms through our processes of meaning making, our value systems and the worldviews we employ. The basis of sustainability is to become conscious of this and choose appropriate participation in this creative process instead of reinforcing unsustainable patterns through our daily actions, while referring responsibility to somebody else. True, long-term sustainability is possible only if more and more people become fully conscious of our individual and collective creative powers and assume responsibility for their own participation in the process of sustainability, through cooperation with the community of life. Awareness of our fundamental interconnectedness and interdependence with all of life spawns the realization that we cannot maintain human, community, or societal health without maintaining the health of ecosystems and the planet as a whole. Thomas Greco Jr. beautifully expressed the enormous potential this insight has for individual and community empowerment. His vision of human potential is reproduced in the Box below (see Box 6.7). What Greco describes is a realization that more and more people are having everyday. It is in this realization that true sustainability can take root. But the process of transformation can only be sustained if we begin to act in accordance with our insights. At the international level there have been a number of previous attempts to formulate visions of a sustainable future. In 1948, the General Assembly of the United Nations proclaimed the adoption of the ‘Universal Declaration of Human Rights’ (see Bloom 2004, pp.253–260 for a reproduction). In 1986, the World Health Organization published the ‘Ottawa Charter for Health Promotion’ (see Brown et al., 2005, pp.101–105). In June 1992, after a conference in Rio de Janeiro, the United Nations published a ‘Declaration on Environment and Development’ (see Brown et al., 2005, pp.112–117 for a reproduction). This was followed by the publication and international adoption of ‘Agenda 21’ as a blueprint for a social, economic,and environmental sustainability [since this thesis was published in 2006 the SDGs and Agenda 2030 were launched in 2015 as a continuation of the UN sustainable development commitment]. The most widely inclusive and comprehensive document of this kind that has been published to date was developed over almost a decade of worldwide consultation and dialogue through the support of the ‘Green Cross’, founded by Michael Gorbachov and the ‘United Nations Educational, Scientific and Cultural Organisation’ (UNESCO). The Earth Charter, was published in 2000, and is structured around the following basic principles: respect and care for the community of life; ecological integrity; social and economic justice; and democracy, non-violence, and peace (see www.earthcharter.org ). Since its publication the vision of global sustainability, equity, justice and peace formulated in the Earth Charter has been adopted by an increasing number of national and international organizations. It will hopefully provide a basis for fruitful discussion about the necessary local, regional, national, and international dialogues about how to effectively implement such a vision of a sustainable human civilization. The multi-facetted challenges that humanity is facing at the beginning of the third millennium are sending a clear signal: business as usual is no longer an option. The world will change even more drastically during the 21st century than it has done during the 20th century. If we allow this change to be driven by narrowly conceived economic and national interests and disregard global interconnectedness and interdependences as well as our reliance on the planet’s ecological life- support systems, we will do so at an unprecedented cost in the lives of humans and other species with whom we are co-inhabiting this fragile planet. In 1991, Ralph Metzner, a psychologist at the California Institute of Integral Studies, published an article entitled ‘The Emerging Ecological Worldview’ in Resurgence. Metzner tried to formulate the major changes in worldview and humanity’s way of participating in natural process that will be associated with the transition towards an ‘ecological age’ and a sustainable human civilization. 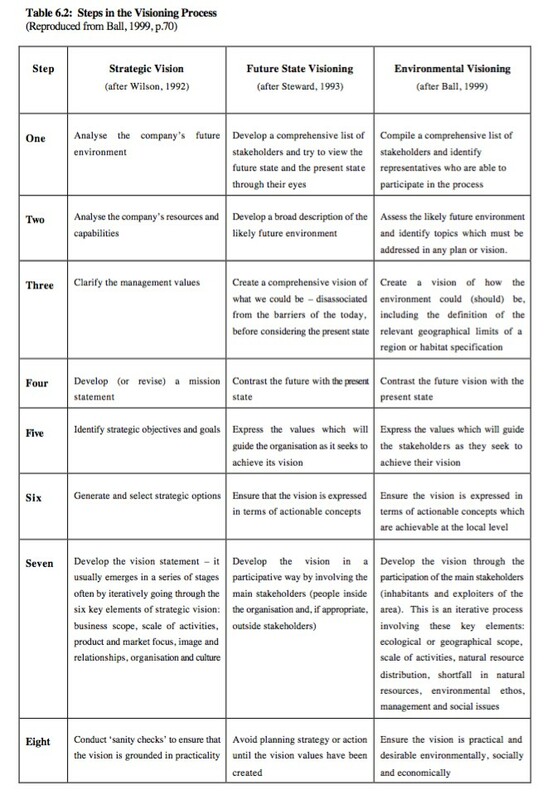 The Table below summarizes his vision (see Table 6.3). 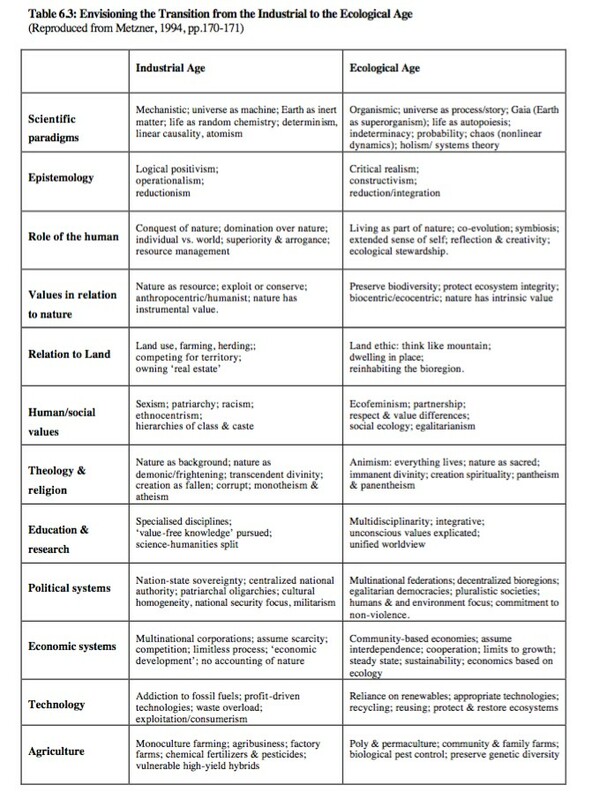 The ecological worldview formulated by Metzner should not be understood as a dualistic opposite to the dominant worldview of the industrial age, rather as an expression of a necessary and healthy evolution of humanity towards a more holistic or integral consciousness that is able to embrace multiple perspectives. Beyond such an ecological worldview lies the integration of old and new modes of consciousness in what might be called an integral or holistic worldview able to transcend and include what came before (see also chapter one). I have learned that it is possible to design with Nature. I have also learned that, through ecological design, it is theoretically possible to have a high civilization using only one tenth of the world’s resources that industrial societies use today. We can reduce the negative human footprint by ninety percent and thrive as a culture. We do not have to destroy the Earth. Ecological design allows us to link human life support systems in a symbiotic way to the rest of the biosphere. Nature, or Gaia, can regain her wilderness and the air, water, and lands can be free of our poisons. That is the vision. That is the possibility.